At Aton Maritime Institute, our mission is to aid navigation, and thereby promote safety at sea, by providing an active understanding of best practices through world-class maritime training of continually improving quality. Here, mariners can obtain required certifications and learn a wide range of subjects (in a classroom or online from home or ship) from a highly qualified instructor. Instructor Capt. Prateek Kumar has the highest Master's license issued by the United States Coast Guard and an MBA from Columbia University, so he is well suited to teach this material. He knows this training will benefit the mariners and the industry and is passionate about providing the thorough training mariners must have. Give us a call in Princeton Junction, New Jersey, at 609-651-3469 to learn more or book your next course. Aton Maritime Institute provides mariners with high quality, effective training in accordance with applicable STCW requirements of IMO and national regulations of various countries globally. 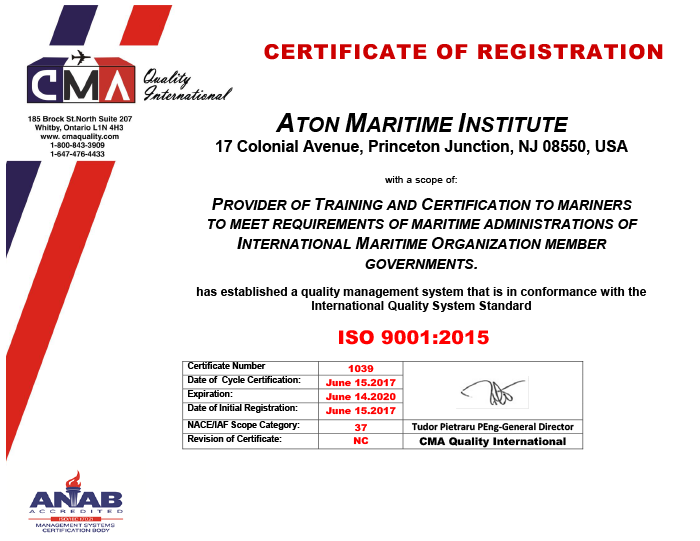 Aton Maritime Institute is committed to achieving continually improving quality in delivery of its training services by use of procedures that meet or exceed requirements of ISO 9001:2015.